Crisp, starry nights, crackling fires & romantic kisses...feel the romance! 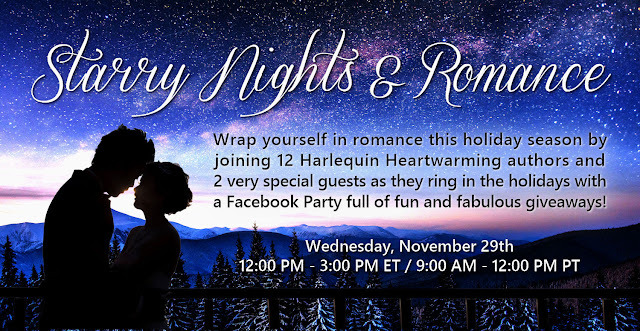 Grab your hot cocoa and join holiday hostesses Catherine Lanigan, Liz Flaherty, Beth Carpenter and Rula Sinara as they celebrate their December Harlequin Heartwarming releases, along with releases by all of the October/November Harlequin Heartwarming authors: Kate James, Melinda Curtis, Amie Denman, Cheryl Harper, Karen Rock, Pamela Tracy, Leigh Riker and Patricia Johns. 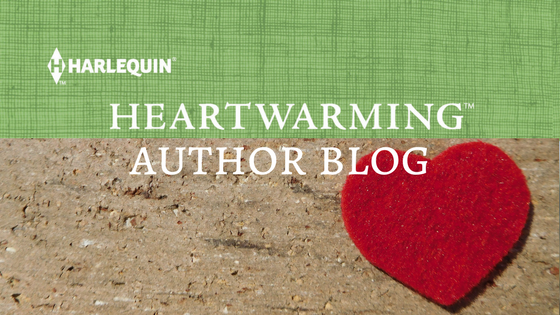 And we have special treat for you...two Special Guests will be partying with us: past Harlequin Heartwarming author and current Grand Central success, the fab Jennifer Snow...and our beloved and newly retired Muriel Jensen, with her final release! Get ready for some fun and a chance to win fabulous prizes! Pop on over to the Starry Nights & Romance event page and join the fun! Some of us have posted sneak peeks at our giveaway prizes and I bet if you go take a look, you won't be able to resist coming to the party. You never know...you might win a prize! If you win, you can keep the goodies to yourself or use them as holiday gifts. And even if you don't win, you'll have a blast and we'll get you in the spirit of the season. We hope to see you there! Good day everybody my name is Mrs Caroline Gilli am here to share with you my life experience how a great man called Dr Alexzander saved me and my marriage.I have been Married & Barren for for 5 years i had no child. i have never been pregnant i was a subject of laughter from my Friends & neighbors, i almost lost my marriage because of this issue.i was so confused that i did not know what to do until i came across this great Dr online and i contacted him at once i was scared weather it was going to work because i never believed things like this before, so i decided to give it a try and i did all what Dr Alexzander asked of me and today to my greatest surprise i took in the first time and i gave birth to a bouncing baby boy and now my marriage that was about crashing before is now restored. my husband now love and want me better, Am so happy for everything that have been happening my life since i met this Dr Alexzander. I want to tell all the women out there who have a similar situatio like that the world is not over YET they should dry up their tears and contact this great man and their problem will be gone or are you also having other problems you can also contact Dr Alexzander, here is how you can contact him alexzanderhightemple@gmail.com Or Contact him via his whats-app number +2348075823891. Merry Christmas to all our Heartwarming friends! We have put together a fabulous party for you all today and there are lots of prizes and surprises for you all. Lots of books, Christmas gifts you can share with family and friends and fun posts! Hit the link and party with us! This party will be great. Every writer on the list is fantastic and the books are so good. Know this will bring in a lot of readers. No worries, LeAnne! You can still sneak a peek at the posts if you want ;). We hope all who made it had fun!